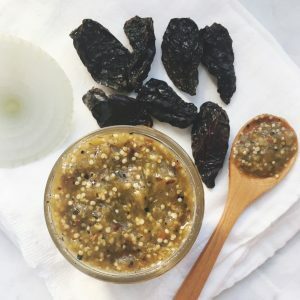 This easy roasted, smoky salsa made with tomatillos and chile morita is great on everything from tacos to scrambled eggs. Preheat your oven or toaster oven to 500ºF (alternatively, you can put them under the broiler). Peel the husks off the tomatillos and wash them with warm water (and soap if necessary) To remove all the sticky sap. Dry and set aside. Line a baking sheet or jelly roll pan with aluminum foil and put the tomatillos on the baking sheet. Roast for about 15 minutes, until the tomatillos start to get black char spots on the top, change colors to a deep, transparent green, and begin to pop. While the tomatillos are roasting, heat a comal or skillet on the stove over medium heat. Once hot, place 2-3 small dried morita chiles on the comal (if they still have a stem on top, tear off and throw away). The chiles will start to inflate; make sure you heat both sides, but don't burn them. They only need to be toasted on the comal for about 30 seconds per side. When the tomatillos are done roasting in the oven, transfer them to a blender or food processor while still hot. Add the toasted chiles, the slice of onion, garlic clove and salt. Blend on high until completely pureed; the salsa should be a reddish-brown color. Serve immediately or refrigerate in a sealed container for up to 2 weeks. This recipe is for a smaller batch, but you can easily double it if you're feeding a crowd. If it's too spicy, add some more roasted tomatillos. If the salsa is too thick, you can thin out with a little bit of water.